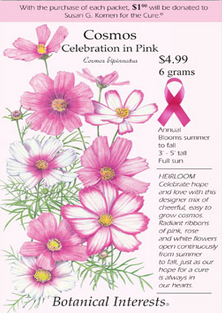 "Celebration in Pink is a cheerful assortment of pink and white cosmos. The seed packets will feature the company’s signature artwork along with the pink Breast Cancer ribbon. Botanical Interests, known for printing information on the inside of its packet, has printed more than just gardening information inside this special packet. Inside, customers will find healthy living tips, including way to incorporate more fruits and vegetables into you diet through gardening. The seed packets will be available from January 1, 2011 through June 30, 2011. The seed company will donate $1 for each packet sold, with a total donation of at least $15,000"